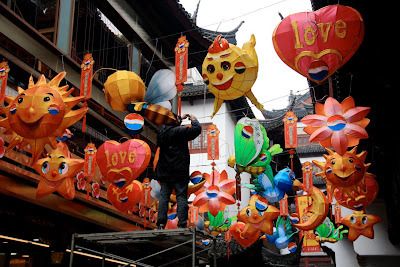 Chinese New Year is fast aproaching (Feb 14, Year of the Tiger), and with it comes the annual Lantern Festival, Yuanxiao, on the date of the first full moon of the Lunar New Year, (Feb 28). Yu Gardens is the lantern epicentre of Shanghai, and they're springing up left, right and centre in all shapes and sizes. Now I love a lantern, as everyone knows, so I was thrilled to bring home three flat packed ones from the Commodities market yesterday. Easy peasy thought I, just whip them out of the cellophane envelope and pull the little string and voila! lanterns x 3 would appear fully formed and ready to hang in my window. Oh but I am in China now and every day brings a small but useful challenge. So out of the bag came 68 pieces of red and gold cardboard, lots of tassels, a hundred small wire rings and no instructions. Not even in Chinese. So as I am swearing and cursing I am imagining whole Chinese families constructing these lanterns with the same ease and grace with which my family constructs our plastic Christmas tree every December. And in my imagination they are also swearing and cursing, just like us.